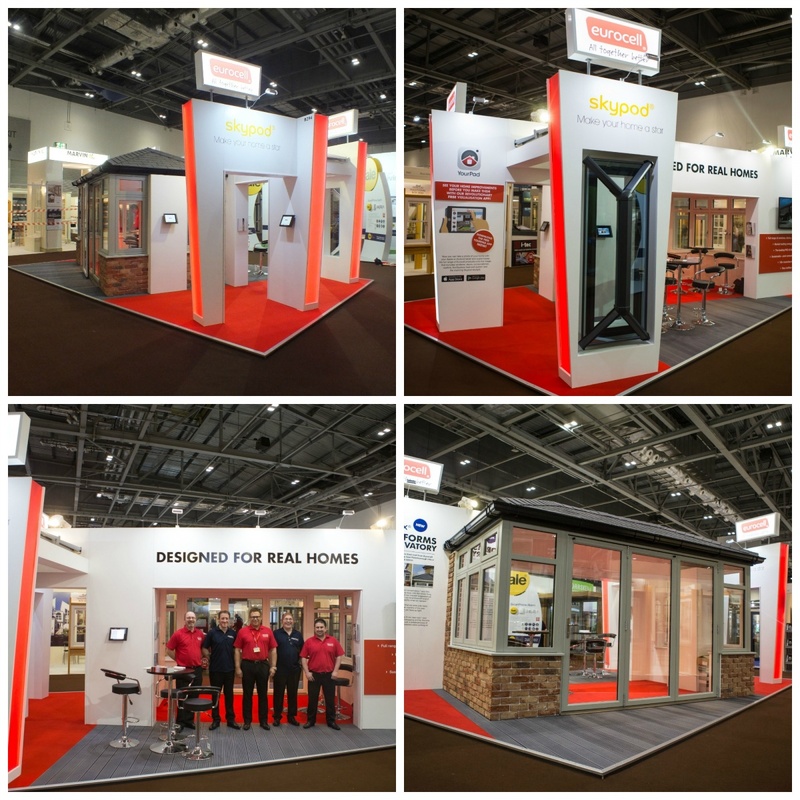 The UK’s leading manufacturer and distributor of UPVC building products, Eurocell, approached us about designing, building and installing a brand new bespoke exhibition stand for their forthcoming show at Grand Designs Live. The custom exhibition stand was designed to showcase some of the brands leading large scale products including bi-fold doors, their Equinox glazed roof and their slate skin roof tiles. We incorporated a full sized conservatory into the bespoke exhibition stand, complete with real facing bricks. This doubled as a featured product display for Eurocell's bi-fold doors, conservatory windows and roof. It was also a part enclosed meeting room for visitors to the exhibition display. The custom exhibition stand was well received at the show and with it's clearly defined zones provided a fantastic base for the Eurocell sales team to demonstrate their product range to customers. The various part secluded areas allowed for several customers and staff to be engaged in discussions at the same time, providing a natural sound barrier with the different structures and walls. We added the detail with cut vinyl graphics and high quality large format print exhibition graphics. The end result was a thing of beauty. Read about the full Eurocell case study in our portfolio. After the Grand Designs Live show the Eurocell Marketing Manager wrote to us to express their delight with the service and quality they received from the team at GH Display. You can read this review here. Later in the year we took this custom exhibition stand to the Build Show for Eurocell and were then asked to design and build them a brand new exhibition stand to be unveiled at the Fit Show, the following year. If you would like to talk to us about our custom exhibition stand design and build services please call us on +44 (0)1733 570222 or complete the design brief form below and we will contact you.